By the end of 1957, Elvis Presley was the unchallenged King of Rock'n'Roll. With nine US chart-topping hits behind him achieved in less than two years, he was the hottest item on any menu, but that very fact may have strongly influenced the US Government in their insistence that Presley should be drafted for national service in the US Army. Inevitably, there was considerable wailing and gnashing of teeth among the multitude of heartbroken female fans, although the media was correctly suspicious about whether Presley would be forced to serve his time like any other John Doe. The cynics felt that their case was proven when an Army spokesman suggested that the most likely posting for Elvis might be to the Army's Special Services Division, as an entertainer performing for his fellow servicemen, as a result of which he might not have to submit to a regular army haircut, and might be allowed to retain his pompadour and long sideburns. 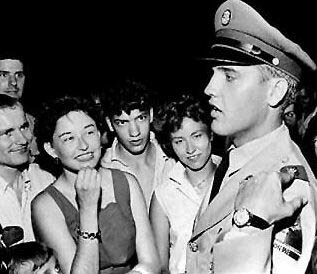 At which point a Republican Senator vociferously enquired why Presley should be treated differently from other conscripts, and it became clear that the publicity scam would fail disastrously unless Elvis was treated like every other recruit and given no special privileges. And yes, his luxuriant crowning glory would be cropped. 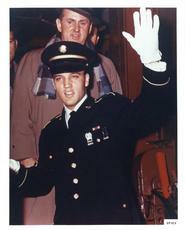 Of course, his manager Colonel Tom Parker wasn't about to miss any publicity opportunities -having already arranged for a brief deferment to allow Elvis to complete filming on 'King Creole', he also wanted to ensure that enough recorded material was 'in the can' to cover at least the major part of his star's unavoidable absence. On the fateful day -Monday March 24th, 1958. Elvis arrived at the Draft Board office in Memphis to find not only a number of fans awaiting his arrival but also a crowd of media representatives primed to document the occasion when The King was transformed into Army Private US53310761, and heard that his pay was to be reduced from $1000 per week to $83.20 per month. His initial posting was to Fort Chaffee, Arkansas. On the next day, it was time for the haircut and Parker made a meal out of ensuring that there was no chance for anyone to collect a lock of Elvis's hair from the floor. When Presley went to collect his uniform, Parker made a point of trying to slip a bootlace tie in his charge's kitbag, but Elvis seemed to think that was taking the circus concept too far. The Army felt much the same, and it was announced - at a press conference - that he would receive his basic combat training at Fort Hood, Texas, with the 2nd Armoured Division. 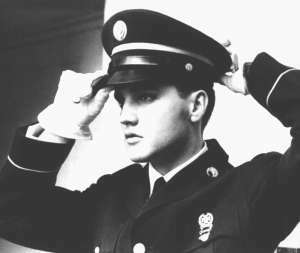 During the two-week leave, which followed basic training, Presley undertook his only recording sessions during his two years as a GI, and also attended the Memphis premiere of King Creole. It was also arranged that Vernon & Gladys Presley, his parents, would live close to Fort Hood so that Elvis could visit them, as he was particularly concerned about his mother's poor health. His concern was justified -on August 14th, 1958, Gladys died of a heart attack at the age of 46. Soon after his mother was cremated, the 2nd Armoured Division was posted to West Germany, and this was the only time during his life that Elvis set foot in Europe. Perhaps in view of his recent bereavement, Vernon Presley and Elvis's grandmother, Minnie Mae Presley, were permitted to rent a house near the Army base so that Elvis could spend his off-duty time in the bosom of his family. Much of the rest of his period as a GI was spent in being a soldier, but it subsequently became clear that Elvis had also found himself a girlfriend in the glamorous shape of Priscilla Beaulieu, the daughter of an Air Force major also stationed in Germany. Priscilla was only 14 and although rumours of a romance were denied at the time, some years later she married Presley and bore his only legitimate child, Lisa Marie. 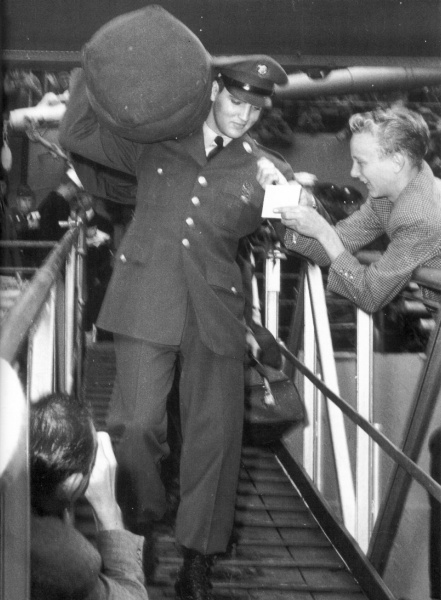 Two months before the end of his tour of duty in Germany, Elvis was promoted to sergeant, and when he was honourably discharged in early March, 1960, it became clear that if anything, his absence had made the hearts of his fans grow fonder: King Creole had been a great success, both as a film and also as a sound track album, while the two years had seen eight more US Top 10 hits, including two chart-toppers, 'Hard Headed Woman' and 'A Big Hunk O' Love'.